We have a range of helicopter experiences that can be booked direct through our website or over the phone at 01664 823846. To book online, use the search function, or select from the City Tours, Exclusive Tours, Trial Lessons or Scenic Tours below. Once you have selected your helicopter tour, scroll down to access information about the group discounts available, the flight schedule, the number of passengers you are booking for, and the names of the passengers. Then, simply add to your basket, head to the check-out and use our secure payment system. Don’t forget, you can also book the passenger seat on your flights, subject to availability. If you would like to book this option, or you need further assistance, feel free to call the friendly team at Central Helicopters. Our helicopter experiences are designed to suit every budget. Our 6-Mile and 15-Mile flights are a thrilling introduction to the magic of helicopter flight, and depart from numerous locations around the country, including Nottingham, Yorkshire, Skegness, the Peak District, Lancashire, and the Lake District. 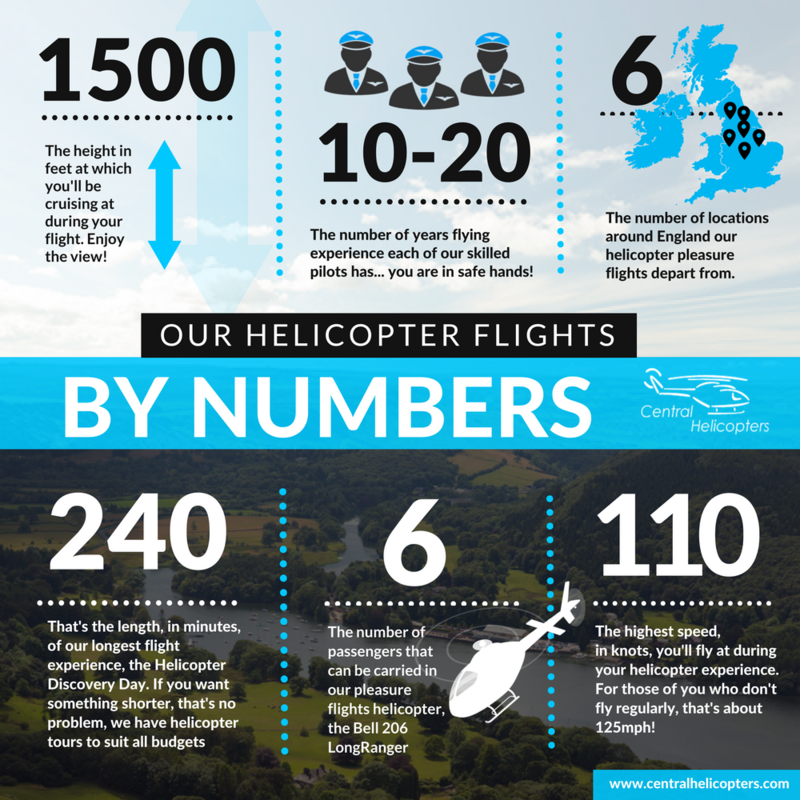 Take a look at our infographic below for more details, and then scroll through our range of helicopter tours.